The late Mr. Zinn’s book, A People’s History of the United States: 1492-Present, was published by Harperperennial Library. He focused his research for the book that spans American history from Christopher Columbus’s arrival to an afterward on the Clinton presidency. He also stressed the importance of including the voices of blacks, women, American Indians, war resisters, and poor laborers of all nationalities into American history. His book looks at history in a more objective light than the history promoted by the government. Most if not all governments tailor, fix, rewrite the official history. Much fuss was made of the Japanese history of WW2 atrocities never being taught to their future generations. As you know “history is written by the victors” and reflects what they want to reflect not always what was. Japan may have lost but they maintained control of their people and history books. The Germans were not so lucky after WW1 and WW2. Howard also discusses the rule of law, a powerful idea whose time has actually come, or a PR scam of the powers that be? The “rule of law” is an idea created from a long history of people seeking fairness and freedom for everyone…. which may actually become a reality if and when more people stand consistently against unfairness, unlawfulness and take action to hold the powerful, elites, bankers, politicians, public servants, lawyers, corporations and judges to the rule of law. 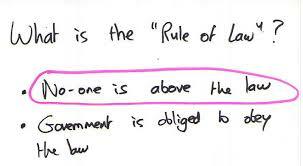 The fact is that “the rule of law” is a relatively recent, acknowledged foundational idea. It is not yet fully realized but is regularly promoted and sold by the elites and powerful as if they respect it and will uphold it FOR you, when they in fact have no intention to. They only claim to uphold, and promise to enforce, the “transparency”, “integrity” and the “rule of law” to gain your support which they then toss it all aside once they have your trust and vote. BUT the rule of law now exists in the law books and consciousness waiting to be upheld and enforced. The standard has been set, agreed to and written down. Now has become the time to enforce the rule of law with EVERYONE for everyone. Rule of law is really a simple idea and basic legal principle that is of extreme prejudice to the way that the “powers that be” operate – is it any wonder they only pay it lip service to gain power, then ignore it all together? So, if they ignore the rule of law, does that mean you should? Or that the rule of law does not exist? To live and enforce the rule of law ultimately lies with each of us not “them” because they will NEVER until they are held to account. Maybe, it’s time for each of us to step up, speak out, take peaceful action to demand and enforce the rule of law for all. A return to honour is pending. Don’t settle for less. Expect honour and integrity from everyone and be an example yourself. comments? feel free to leave them below…. Facebook and Tweet etc. if you like this post.